Health Secretary Kathleen Sebelius Is Resigning : The Two-Way Sebelius is resigning after a five-year term that will no doubt be remembered for the calamitous implementation of Obamacare. Health and Human Services Secretary Kathleen Sebelius is resigning from her post after serving for five years. Health Secrerary Kathleen Sebelius is resigning after a five-year term that will no doubt be remembered for the calamitous implementation of President Obama's signature legislation, the Affordable Care Act. If you remember, when the federal government unveiled HealthCare.gov, where Americans could buy health insurance mandated by Obamacare, the site was essentially useless for weeks after it launched in October. Republicans openly called for Sebelius' resignation, but she vowed to see the troubled website through. "The departure comes as the Obama administration tries to move beyond its early stumbles in carrying out the law, persuade a still-skeptical public of its lasting benefits, and help Democratic incumbents, who face blistering attack ads after supporting the legislation, survive the midterm elections this fall. "Officials said Ms. Sebelius, 65, made the decision to resign and was not forced out. But the frustration at the White House over her performance had become increasingly clear, as administration aides worried that the crippling problems at HealthCare.gov, the website set up to enroll Americans in insurance exchanges, would result in lasting damage to the president's legacy." NPR's Scott Horsley reports that Sylvia Mathews Burwell, currently the director of the Office of Management and Budget, will be nominated by Obama to replace Sebelius. Before taking the job as HHS secretary, Sebelius served six years as the Democratic governor of GOP-dominated Kansas. She is the daughter of the late Ohio Gov. John Gilligan. When she faced the House Energy and Commerce Committee back in October, Sebelius took the fall for the problematic health care site. 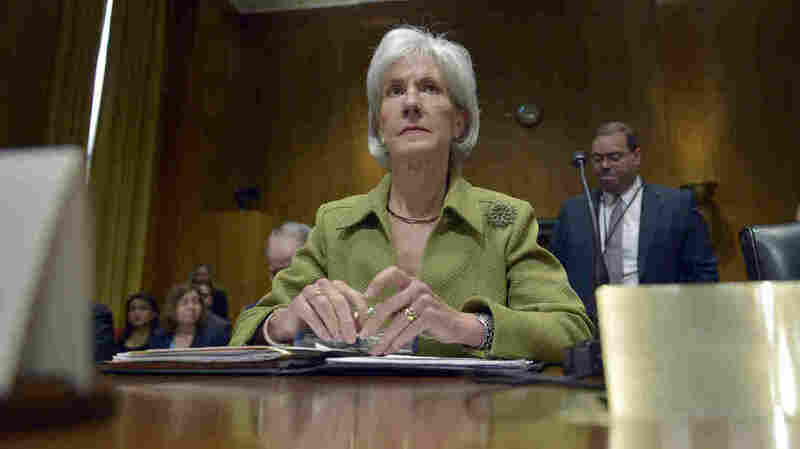 "Let me say directly to these Americans: You deserve better," Sebelius said. "I apologize. I'm accountable to you for fixing these problems. And I'm committed to earning your confidence back by fixing the site." The site was fixed and earlier this month, President Obama announced that during the Affordable Care Act's first open enrollment, more than 7 million Americans had signed up for health insurance. That number represented an achievement for the administration, because it was the original goal. "This law is doing what it's supposed to do," Obama said. "It's working." He thanked the legislators who helped usher the bill through Congress, but he did not thank Sebelius. Scott tells our Newscast unit that the resignation comes about six months after the HealthCare.gov disaster. Scott says that the White House, however, had brought an outside "fix-it" team to correct the problems with the website. "The president himself has said it wasn't Sebelius who was responsible for writing the code of the website, but certainly she was the secretary running the department and if there was a problem with the website she at least should have known about, corrected it and alerted Obama so that he was not saying on the eve of the launch, 'it's going be great, it's going to function like Amazon and Kayak,'" Scott said. Burwell was approved unanimously by the Senate for the OMB position about a year ago. NPR's Scott Horsley says her confirmation may be more controversial this time around. According to the AP, Burwell is a Clinton administration veteran. She was chief of staff to former Treasury Secretary Robert Rubin. Before taking the OMB job, she ran the Walmart Foundation and served as president of the Gates Foundation's Global Development Program.